Tim Burton’s Batman turns 25 today, believe it or not. And in the quarter-century since the movie was released, superhero movies have turned into a genre all their own. Some of have been more coherent than Batman, some have been slicker, some even more enjoyable. But none have been as off-kilter, confused, and passionate as the 1989 film—and that doesn’t bode well for the future of the genre. Let’s get this out of the way first: Batman is not necessarily a good movie. Yes, there’s a lot that’s good about it—Michael Keaton made a surprisingly great Bruce Wayne, despite the fan outcry at his announcement, and the movie looks amazing thanks to Burton’s direction and Anton Furst’s production design—but overall the movie is as uneven as a mountain range. A lot of that can be put down to the performances, which range widely in intensity; at times, two people sharing a scene seem like they’re acting in entirely different movies (e.g., Michael Gough’s Alfred with Kim Basinger’s Vicki Vale, or Jack Nicholson with… well, anyone, really). It’s that philosophical tug-of-war that makes the movie so compelling 25 years later. Burton got his way when it came to casting Batman, but Nicholson as Joker was the studio’s decision, as was Basinger as Vicki Vale (Keaton reportedly wanted Brad Dourif, and Sean Young had the female lead until an accident just before shooting began). Likewise, Burton got his way with Danny Elfman’s melodramatic score, but the studio opted instead to promote WB Records signee Prince’s soundtrack for synergy’s sake. 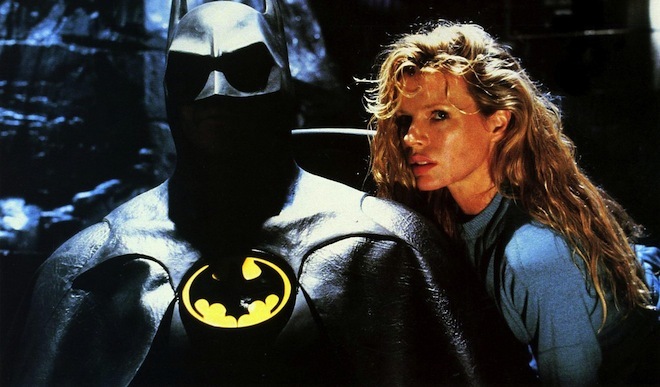 There’s more; the original climax of the movie—the Joker kills Vicki Vale, sending Batman over the edge—was dumped by the studio during filming, leading to a shoot where no one actually knew how the story would end until they’d already filmed it. And so on, and so on. By all regular standards, Batman is a mess. The superhero movies of today were born of Burton’s desire to make superheroes gritty and “realistic,” and Warners’ desire to make Batman as mainstream and profitable as possible. Compare the self-conscious camp of Christopher Reeves’ Superman movies to the self-conscious sincerity of Man of Steel, and ask yourself whether we could’ve gotten there without Burton’s adherence to the idea that Batman be taken seriously. Just one look at the aesthetic of Burton’s movie, and you can see the roots of the re-imagined X-Men and Avengers uniforms. But rather than being resolved before the movie was released, the argument played out on screen. The result was something much more contentious than today’s superhero movies—which, having no need to validate superheroes as a worthy genre, by now seem almost smug. For all its flaws, Batman was clearly a movie made by someone who wanted to say something about the character—something more than “how much money can we make?” It’d be nice if more superhero movies today felt the same. El origen del género superheroico en el cine, dueño de uno de los mejores (sino EL mejor) batimóviles, feliz cumple BatiKeaton! Re: El Batiburton cumple 25 años!